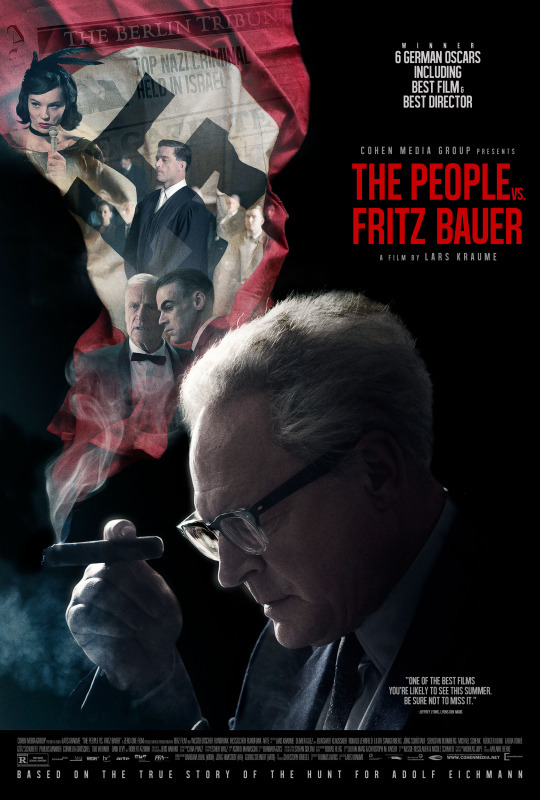 The fictionalized story of German prosecutor Fritz Bauer, who was tasked with finding German war criminals. When his office found Adolf Eichmann he tipped off the Israelis as to his whereabouts because his fellow country men didn't want him found, being too terrified of what Eichmann might reveal about his collaborators. This award winning film is going to delight some audiences and bore others. Constructed very much to make you aware that it is about something important and carrying a political agenda the film is very much an art film. It is a good looking film with some really great performances, Burghart Klaußner as Bauer. in particular. Its a kind of big screen Masterpiece Theater. The problem that most audiences are going to run into is the pacing which shifts unevenly between leisurely and quick paced. Several sequences seem to go on much too long while others, some involving the investigation speed along a bit too fast. For me the film never drew me in enough to fully care because I never felt settled in with how the film went. The other problem with the film is that it is very much set up to be a film about something. You know this is the sort of a film where writer/director Lars Kraume has Bauer end the film by looking into the camera and saying how nothing is ever going to stop him again. Everything is set up for a purpose to the extent that despite Kraume's claims that the film is historically accurate he has constructed a young prosecutor in order to work in a subplot about Bauer's homosexuality, something that apparently had no bearing on anything that happened, and to clumsily reveal that some Nazi laws were still in effect even after 1957. The subplot feels artificial and distracting and I kept asking why it was there.